Dropbox is a very popular cloud-based file hosting service, which I can personally recommend, as I use it myself quite frequently. Setting up an account is free, and it offers a decent amount of storage space to be used indefinitely without ever having to hand over anything more personal than an email address. There are lots of ways to integrate the service with your desktops, laptops, mobile devices and generic web access terminals. And they have their own iOS app, too. What MolSync adds is a chemically-aware client. The interface is based around a folder-browsing paradigm. Folders can be opened and their contents browsed. Any file type that is recognised as containing chemical data, i.e. molecules, reactions and datasheets, can be opened and viewed. 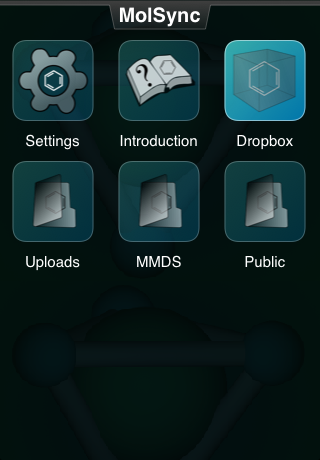 Chemical data can be downloaded and passed to other apps, such as MMDS or MolPrime, and also passed back in the opposite direction: when opening chemical data with the MolSync app, it will offer to upload the data to a selected folder. There are also file format conversion features, and options to generate graphics (e.g. SVG and PNG files) from chemical data, and upload to the Dropbox repository. The current version on the AppStore – version 1.0 – is classified as a minimum viable product release, and the price is low. The roadmap for MolSync involves an aggressive series of new features and upgrades, which will be accompanied by price increases, so anyone who is willing to be an early adopter will get a good deal in the long run! The next major release of MolSync will coincide with a major release of the Mobile Molecular DataSheet (MMDS), which will increase the degree of interaction between the two apps. Files stored in a Dropbox folder will be able to be conveniently associated with a corresponding datasheet, stored locally by MMDS, and periodically updated via MolSync. This paired functionality will offer a convenient and powerful way to synchronise data on one-or-more mobile devices with cloud-hosted files that are accessible from basically anything with an internet connection. Storing chemical data on a cloud-hosted server opens the door to all kinds of interesting collaboration and sharing options. Anyone with a Dropbox account has probably noticed that the default configuration includes a public folder, which allows anyone to grab the contents via an anonymous URL download. This feature alone makes all kinds of things possible. Stay tuned for more announcements relating to MolSync.